Description: The Empress Necklace features the historic Josephine knot, and there is one Celtic Button securing the pendant. You can use any type of material, but Satin cord looks very feminine. 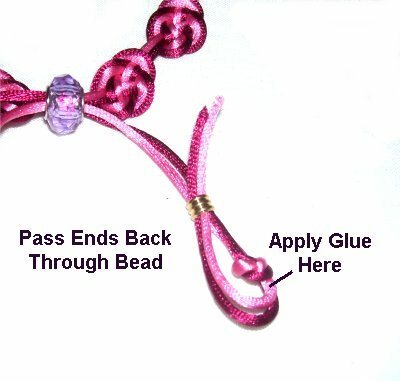 Beads can be added between the knots. 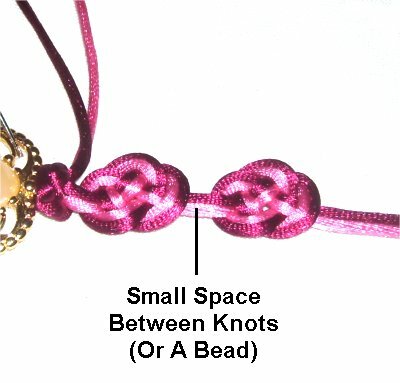 The clasp for this Micro-Macrame bracelet is a sliding bead closure, which can be changed if necessary. 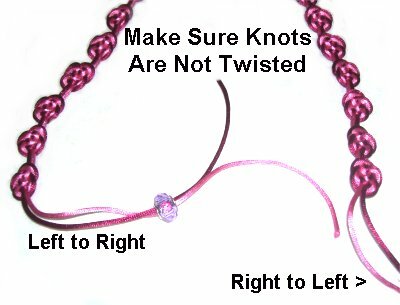 This Macrame pattern is rated moderate, and should be made by those who have experience with the knots used. 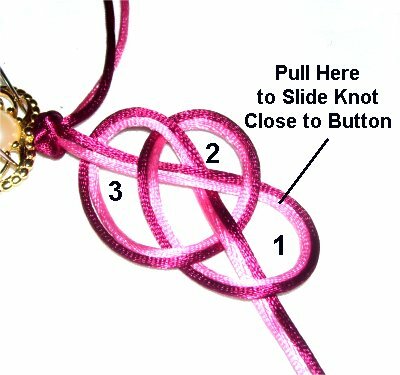 You need to be able to tie Josephine knots in a series, and in opposite directions. 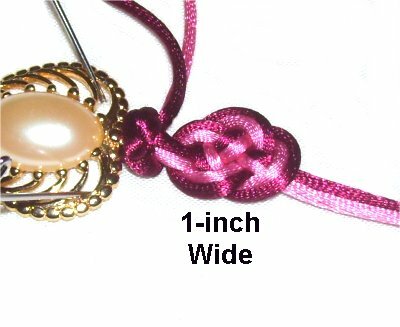 Cut two cords (one of each color) at least 4 yards long, for necklace sizes 24 inches or less. 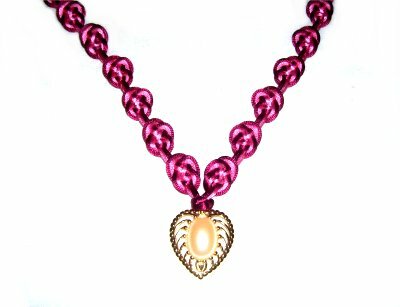 To make a longer Empress Necklace, increase the length of the cords. Important: Do not push pins through Satin material if you plan to use it. Lean the pins over the cords, or use the Cross-Pin Technique. 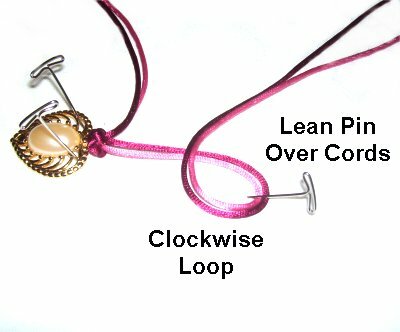 Step 1: Slide both cords through the loop in the pendant, matching the ends so it rests at the center. Secure the pendant at your left, with the cords horizontal. The one closest to you is the working cord (color A). Secure the other three so they are taut, since they are holding cords. Make a counter-clockwise loop with the working cord, passing under the three holding cords. When you bring it down, pass over the holding cords. Step 2: Make the second counter-clockwise loop, passing under the holding cords, and then over them as you bring it down. Arrange the loop so it rests partly on top of loop 1, and slightly to the right. Make sure you can easily identify the space indicated, between the two loops. Step 3: Start the third loop by passing the end under the holding cords. Weave it over - under - over - under the four segments (loops 1 and 2). Position it to to the right of loop 2. Step 4: To make loop 4, bring the end under the holding cords, over the right area of loop 3, and out through the space between loops 1 and 2. Another way to look at this important step is to pass over the first segment, and under the next two. When you tighten the first loop, it pulls the knot close to the pendant, right where it should be. Hold it steady on the surface with one hand, and pull on loop 2, removing ALL the slack from the first loop. Do the same for loops 3 and 4. The last thing you do is pull on the end to tighten loop 4. Make sure you tighten each loop all the way, or the knot will be too loose. 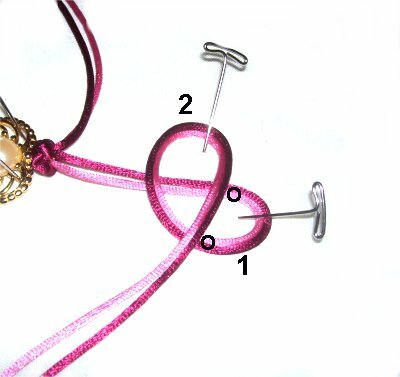 Step 6: Slide the button knot against the pendant, which should remain on the left. Divide the four cords into two sets containing one cord of each color. In the example shown, color A is wine, and is on the outside of each loop. Color B is pink, and is on the inside. Step 1: Make a clockwise loop, arranging the cords neatly. Make sure they are not crossed. Lean the pin over the cords to secure the loops, unless you prefer the Cross Pin Technique. Step 2: Rotate the two cords clockwise, creating a second loop (2). Bring the end to the bottom, passing over loop 1. Make sure nothing is twisted, and the cords are secured well. 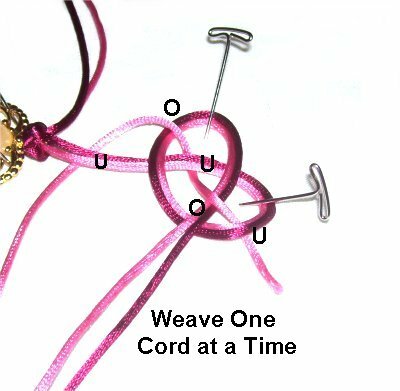 So use the color B cord, and pass it under the segment coming from the pendant. 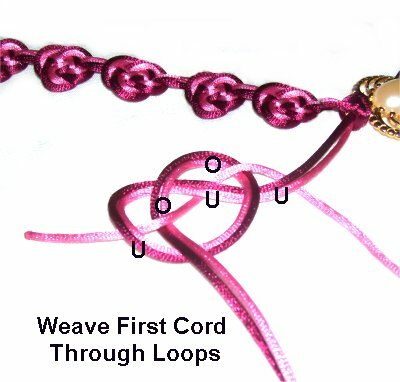 Weave through over - under - over - under, creating loop 3. Step 4: Use color A and follow the same path, fitting it around the outside of the other cord. Step 5: Begin to tighten the Josephine knot by pulling on loop 1, which is on the right. This will move the entire knot closer to the button knot. To remove the slack, pull on loop 2, followed by 3, and then the end. 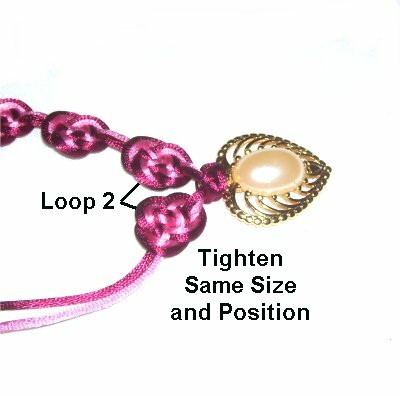 Reduce the size of each loop even more, so the entire Josephine knot is 1 inch in size. Make sure it's as close to the button knot as possible. 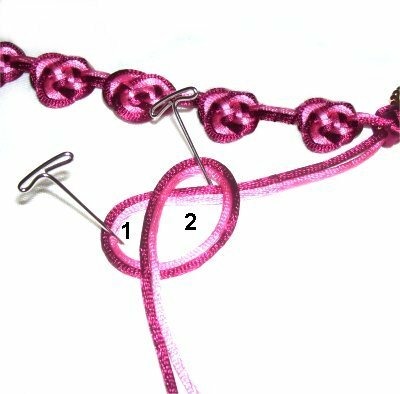 Step 6: Repeat steps 1 - 5, tying enough Josephine knots to create the first half of the Empress Necklace. So for a 24-inch necklace, the first half should be 12 inches. There should be a small amount of space between the knots. You can add a bead between them if you wish. Step 1: Turn the entire necklace around, so you work right to left for the second half. 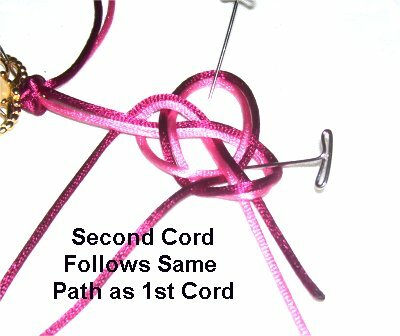 This is the easiest way to ensure the knots match on each half. Make a counter-clockwise loop with both cords. 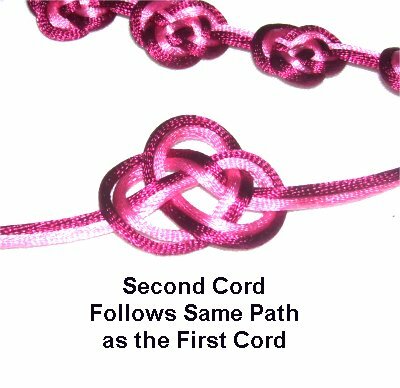 Design Tip: By reversing direction when tying the second half of the Empress necklace, the second loop of each knot will be facing each another (inward). Step 2: Create loop 2 in a counter-clockwise direction, too. Pass over loop 1 as you bring it down, heading toward you. Step 3: Weave color A under the segment coming from the pendant. Weave it through over - under - over - under. You should be moving right to left. Step 4: Weave color B, following the same path as the first, resting on the outside of the loop. Before tightening, make sure nothing is twisted. 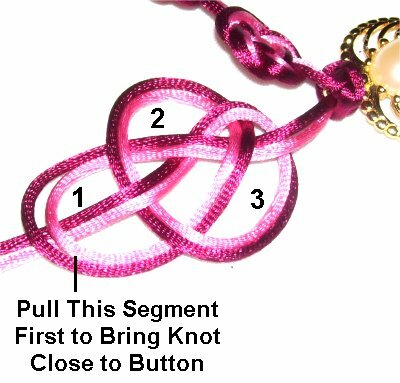 Pull on the segment furthest to the left (loop 1), to bring the knot closer to the pendant. Remove the slack and adjust the size of all three loops, until the knot is the same size as all the others. Loop 2 should be on the inside. Step 6: Repeat steps 1 - 5, tying the same number of knots as the first half. Match the positions of the knots if possible. Step 7: Arrange the Empress Necklace vertically, making sure nothing is twisted and the front of the knots are facing upward. Slide the ends from the left half through the bead for the clasp, left to right. The cords from the right half are passed through right to left (opposite directions). Step 8: Pull the ends to close the Empress Necklace completely. Slide one of the beads for the ends onto the two cords on one side of the clasp. 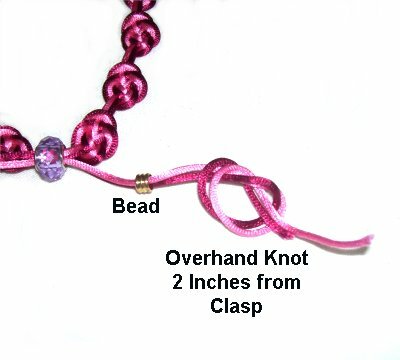 Measure from the bead down 2 to 4 inches, and tie an Overhand knot. Tighten it loosely. Repeat this process with the other two cords. 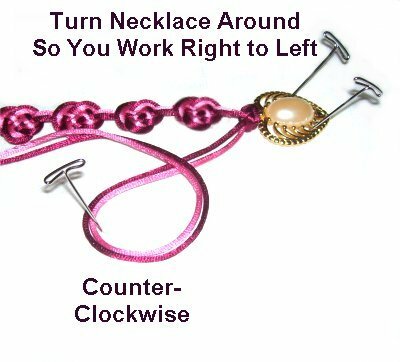 Stretch open the necklace by moving the bead for the clasp out to where the Overhand knots are placed. Make sure it fits over your head. Adjust the Overhand knots so they are further out, if necessary. Make any other adjustments needed, before tightening the two knots firmly. Step 9: Pass the two ends back through the bead, applying glue next to the Overhand knot. Repeat this with the other two ends. When the glue is completely dry, cut off the excess material flush with the edge of the beads. Have any comments about the Empress Necklace? Contact Me.